Arsenal chief executive Ivan Gazidis says the club are ready to "escalate" their spending next season. Asked whether Arsenal could afford to spend a £20m transfer fee on a single player, and offer salaries of £200,000 per week, he said: "Of course we could do that. We could do more than that." 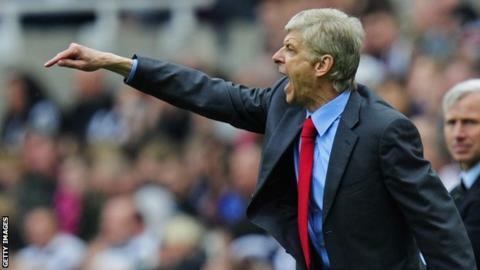 But he warned that boss Arsene Wenger, who Gazidis says will stay "long term", will not necessarily spend such money. "It is going to be the players that Arsene believes in," Gazidis said. "He is pretty blind to price tags, he looks at what he sees with his eyes and makes judgements based on that, not on reputations and prices." The Gunners have been linked with summer moves for and Real Madrid forward Gonzalo Higuain. In England, only Manchester United and Chelsea brought in more revenue than the north London club during the 2011-12 season, according to the Deloitte Annual Review of Football Finance 2013. Arsenal signed a new £150m shirt-sponsorship deal with Emirates airline in November, while they have also brought in almost £75m from the recent sales of Samir Nasri, Cesc Fabregas and Robin van Persie. "We have a certain amount of money which we have held in reserve," Gazidis said. "We also have new revenue streams coming on board and all of these things mean we can do some things which would excite you, but what excites Arsene isn't necessarily what excites you. "This year we are beginning to see something we have been planning for some time - the escalation in our financial firepower. "That is going to happen partly into next season, it is part way available now in the summer, but the following season as well. "It is a progression over the next two seasons and is quite significant for the club." Wenger, 63, is starting the final season of his current contract but Arsenal expect him to sign a new deal. Gazidis said: "We have got a fantastic manager. We hope that he wants to do what he is doing for the long term. I believe he does. "Quietly and at the right time I think we will make an announcement on a new deal when things are put in place." in the Premier League last month, securing Champions League football for the 17th successive year. But the club have not won a trophy since lifting the FA Cup in 2005, and had a poor season in the cups last year. They went out of the Capital One Cup to League Two side Bradford and lost in the FA Cup at home to Championship side Blackburn. Their European hopes were ended at the first knock-out stage by eventual winners Bayern Munich, despite a second-leg win in Germany. However, Gazidis says he is confident they can win trophies again under Wenger. He said: "We have a great relationship and he has a great relationship with the board as well. "We have got a lot of confidence in Arsene that he is the right person to take the club forward."